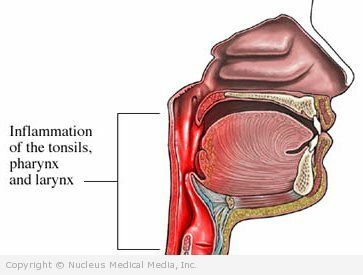 Viral pharyngitis is a sore, inflamed throat caused by a virus. The doctor will ask about your symptoms and medical history, and perform a physical exam. Most viral sore throats are diagnosed based on the symptoms and examination of the throat. Sometimes the throat will be swabbed to make sure that the sore throat isn’t due to strep infection, which requires treatment with antibiotics. There are no treatments to cure a viral sore throat. Most cases of viral pharyngitis heal on their own within about a week’s time. Sore throat pain can be treated with acetaminophen or ibuprofen. Gargling with warm salt water can help relieve a sore throat. Using throat lozenges every couple of hours can help relieve sore throat and cough. Drink plenty of fluids. Hot drinks and soups can be very soothing for a sore throat. Consider running a cool-mist humidifier. It can help keep your nasal passages moist and reduce congestion, two factors that can worsen a sore throat. Practice good hygiene, including careful hand washing. Don’t share food or beverages with other people. Avoid areas where people are smoking. Viral sore throat is a “diagnosis of exclusion” made when sore throat is present and strep is regarded as unlikely. Even in the absence of strep, some types of sore throats need further tests or treatment. Be sure to seek care if your sore throat is worsening, is associated with new, or serious symptoms, especially difficulty breathing, weakness, chills, or is not resolving within the time frame that your doctor predicted.